PLEASE SCROLL DOWN To View Our Upcoming German Rottweiler Puppies litters planned for the year 2013!! During the year 2013 we have the some of the most phenomenal breedings that we have ever planned in the famed history of our kennel! The following combinations are thoughtfully prepared, and weigh the strengths and weaknesses of the combined pair in a way that we, and Zwinger Vom Schutzlowen-Blut, think will be most beneficial for the Rottweiler breed going forward! If you are a Rottweiler working and show historian and/or pedigree buff we think that you will be quite pleased! NEW LITTER ANNOUNCEMENTS COMING AT THE END OF THE WEEK OF MAY 11th 2013!! At Atlantahaus Rottweilers and Zwinger Vom Schutzlowen-Blut, we always make sure that rottweiler breeding kennels that we do business with in Germany and here in The States have some of their own rottweiler kennel’s produce on their German rottweiler show and breeding roster. You see, that is a rather simple way to see where the rottweiler breeders heart is because the only reason that rottweiler breeders don’t keep their own German rottweiler puppies is because it takes too long for them to reach rottweiler code of ethics breeding age. This should tell you that the rottweiler breeder is only interested in having as many rottweiler puppy litters as they can as fast as they can to make more money. It’s a shame that they don’t take the time to raise their own German rottweiler puppies, train and show them, and see them reach their full potential, but again, all of these things result in losses in the short term, and are therefore inconsiderable to them. Unfortunately this mentality often also leads to focus on German rottweiler sales over trying to find the perfect German rottweiler puppy match for an individual customer’s needs. Well, that is about as close as we will come to talking bad about other rottweiler kennels, and we would never mention any names, but it is personally disheartening when attempting perfection in rottweiler breeding is not viewed as a must, but rather as an overly expensive option. We try to shoot straight with our customers always, and for this reason we have never had a problem with a single individual customer. Rottweiler breeders are another story altogether, some even when selling to them, but what we have listed above will just have to act as a short version of some very tiring, hard lessons that we have learned over the years about a few of the German rottweiler breeders that are out there. As code of ethics rottweiler breeders, we always try to improve upon our last German rottweiler litter and always try to improve the German rottweiler breed as a whole. We are a German rottweiler breeder that you can count on to go above and beyond to satisfy your needs and goals for your future relationship with your new German rottweiler puppy as a valued family member, guardian, and exposition of beauty. We are a German rottweiler breeder offering rottweiler puppies for sale for show, companionship and protection. All of our German rottweiler breedings have the focus of producing German rottweilers with incredible working ability combined with show stopping good looks for the German rottweiler style shows. It has been our experience that you can have both, so long as you start off with the right German rottweiler breeding pair. We believe that in order to be successful rottweiler breeders we must not let the production of quality German rottweiler puppies end at the decision of which German rottweilers to pair. We feel the need to also take great pride in the taught and conditioned temperament and disposition of our German rottweiler puppies when they go to their new German rottweiler owner’s homes. We imprint all of our German rottweiler puppies from birth. Imprinting is a several week long process of desensitization of the rottweilerpuppies mouth as well as a daily regimen of other calm submissive drills that allow the rottweiler puppies to place themselves under the control of humans while maintaining their individual personalities. Through our extensive research of the subject, we believe that we have come up with the perfect routine to enable our German rottweiler kennel to condition our rottweiler puppies to be obedient to humans without breaking their spirit. It is very important to know how far to go with the German rottweiler imprinting process so that you do not surpress any of the rottweiler puppies individual personality traits, while still managing to achieve the optimal conditioning results. Imprinting is a simple and non invasive way to achieve these desired results without the rottweiler puppy even knowing that it is being trained. What the German rottweiler puppies see as daily playful games, are actually valuable life lessons that they are learning at their own pace each day. We feel that German rottweiler breeder’s have a responsibility to take the time to teach each rottweiler puppy these valuable lessons, thereby setting the proper foundation for the German rottweiler puppy’s education from its future owners. 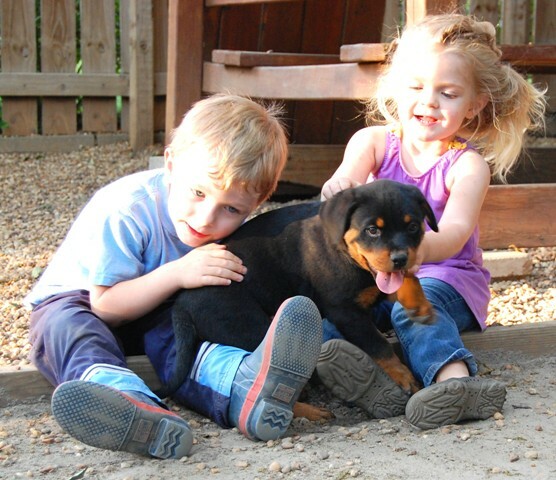 All of our German rottweiler puppies are also socialized well with other animals and with our children from the age of three or four weeks old until they go to their new homes. This provides our customer’s a well socialized, confident, happy German Rottweiler puppy from day one. We constantly hear from our new owners that they are blown away by their new Rottweiler puppy’s calm, confident, and loving personality from the very second that they meet them. We can’t help but take great pride in telling them that we have worked towards that foundation for several weeks, and we feel confident that their new German Rottweiler puppy is ready to continue the learning process with them from here on out. Over the years it has always amazed us how many people there are out the breeding rottweilers that have little or no knowledge of the important rottweilers throughout history that have shaped our breed. It is actually sad to us that some of our customers have done more research on rottweiler bloodlines than some of the people who are breeding and showing. 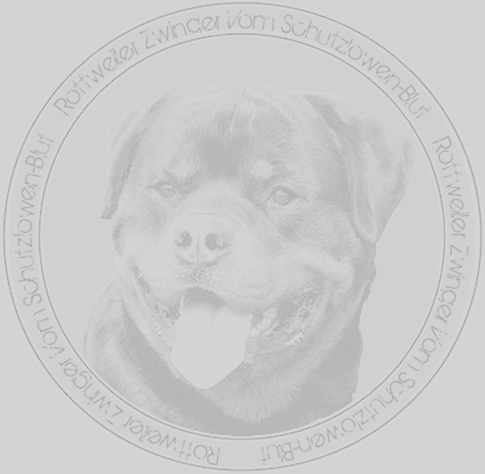 Rottweilers and the preservation of the rottweiler breed are of the utmost importance to us at Zwinger Vom Schutzlowen-Blut. It is no secret that people jokingly refer to me as the rottweiler computer, and I actually take that as a HUGE compliment. I have been around the breed my entire life, and I think that anything less than this level of knowledge about the breed would be a embarasment to my famil's name with the breed. I do realize that most people don't have the time or the desire to have this type of grasp of the breeds history, and I hold myself responsible for providing the type of rottweiler puppy to these customers that I would have in my own kennel.. Some of the many Rottweilers we have studied and admired over the years include: Addi Vom Herrenholz, Adrian Vom Dammerwald, Afra Vom Wildberger Schloss, Alfa Vom Kodiac, Aki Von Der Peeler Hutte, Akino Vom Vistaler Land, Akino Von Der Lauterbrucke, Akira Vom Grossen Tal, Aleo Vom Wallgraben, Alex Vom Dobeltal, Alex Vom Herrenholz, Alex Von Ludwigshafen/See, Amadeus Vom Silberpfeil, Ambassador Von Shambala, Amigo Vom Kressbach, Amikos Dina, Amos, Ana, Andro Von Der Lauterbrucke, Anja Vom Schwaiger Wappen, Anka Vom Lohauserholz, Anna Von Rauberfanger, Antje Von Der Frankentanne, Arko Vom Hirshbrunnele, Arko Von Der Waldachquelle, Arko Von Der Werther-Stadt, Arno Von Der Wanne, Aron Von Alt-Mengenich, Asco Von Der Lauterbrucke, Astor Vom Fusse Der Eifel, Astor Vom Landgraben, Astor Von Junipera, Axel Von Der Nedermolen, Axel Von Der Kappenbergerheide, Ayk Von Biksheim, Balou Vom Silberblick,Barbel Vom Grevingsberg, Barni, Basko Vom Kressbach, Basko Vom Obergrombacher Schloss, Bazi Vom Zimmerplatz, Bea Mathilda Vom Haus-Kalbas, Bea Von Der Bleichstrasse, Bea Von Der Hembachbrucke, Bea Von Der Teufelsbrucke, Bejbi, Beni, Benno Vom Allgauer Tor, Benno Von Der Schwarzen Heide, Benn Vom Ruppertsbach, Ben Vom Schwaiger Rathaus, Berno Von Remchingen, Bessy Od Dragicevica, Bessy Vom Haus Krammer, Bessy Von Siki Rottweiler, Beta Von Siki Rottweiler, Beyra Von Harkos, Bierstadts Hauloni, Biko Vom Herrenholz, Black Diamond Rott Nora, Black Od Dragicevica, Black Rott Jarco, Black Turk Euro, Black Turk Gepeto, Black Turk Lion, Blitz Vom Schloss Westerwinkel, Blitz Von Lucas, Brando Vom Dattelner Hof, Brando Vom Haus Neubrand, Brando Von Der Wasserwald, Britta Von Haus Krammer, Bronko Od Dragicevica, Bronko Vom Dattelner Hof, Bruno Vom Heidebaron, Brutal Von Der Koperkraft, Bulli Vom Hungerbuhl, Burga Vom Haus Brabantpark, Burga Von Der Zufluct, Burley Von Morgen Carroll, Carlo Vom Hamberger Michel, Casar Vom Zimmerplatz, Casi Vom Schoenfelden, Cassius Lad, Chakka Von Der Berghalbinsel, Champ Vom Atlanta Haus, Champ Von Der Scherau, Champ Vom Vistaler Land, Chan Von Der Bleichstrasse, Cher Vom Silberblick, Chris Vom Obergrombacher Scholss, Cira Vom Eselsbergertal, Cira Von Der Koperkraft, Cita Vom Sittard, Cliff Vom Oeterkotten, Cliff Von Der Konigskanzel, Condor Von Der Frankentanne, Cora Vom Zimmerplatz, Cujo Von Der Burg Weibertrue, Dack Von Der Meierei, Daisy Crni Lotos, Danjo Vom Schwaiger Wappen, Daphne Von Der Lauterbrucke, Dascha Von Burgthann, Dasko Vom Eisplatz, Dasko Vom Schloss Haus Forst, Darla Vom Keiser Wappen, Debby Vom Hause Fritz, Deiter Vom Kohlwald, Dik Vom Haus Milsped, Dina Vom Kaiserberg, Dingo Vom Schwaiger Wappen, Dionys Od Dragicevica, Disco Van Het Brabantpark, Dixi Vom Hasenborn, Django Von Der Lauterbrucke, Djerbo Van ‘T Straotje, Doc Von Der Teufelsbrucke, Dolf Vom Weissen Graben, Dolli Vom Schloss Ickern, Dolli Vom Schloss Reitheim, Dolli Von Der Meierei, Donna Vom Schwaiger Wappen, Donnerschlag V. Kertzenlicht, Donner Vom Herrengarten, Dora Vom Burgtobel, Dora Von Der Nahe, Droll Vom Hause Karmasin, Droll Von Der Brotzingergasse, Duuck Von Der Nedermolen, Dux Vom Duracher Tobel, Dux Vom Hungerbuhl, Eddy Vom Hammerbachtal, Elko Vom Kastanienbaum, Endy Von Der Kurpfalz, Eppo Von Der Keizerslanden, Erno Von Wellesweiler, Ero Vom Haus Westphal, Etzel Vom Schwaiger Rathaus, Evi Von Der Crossener Ranch, Eyck Von Tengen, Face Von Der Teufelsbrucke, Falco Van Het Brabantpark, Falco Von Der Teufelsbrucke, Falko Vom Gruntenblick, Falko Vom Sittard, Falko Von Der Tente, Fanto Vom Kummelsee, Farah Von Burgthann, Fax Von Tengen, Ferro Von Der Lowenau, Ferro Von Der Teufelsbrucke, Fetz Vom Oelberg, Figo Vom Grossen Tal, Flash Vom Wolfert Turm, Flavio Vom Dammerwald, Frenki Mali Medvjed, Frida Vom Calibra, Furfutz Vom Grossen Tal, Furst Vom Wolfert Turm, Gary Von Hohenhameln, Gawan Vom Zimmerplatz, Gerlach Van Het Brabantpark, Gil Crni Lotos, Gil Von Burgthann, Gil Von Hause Milsped, Gizo Vom Grossen Tal, Golda Van Het Brabantpark, Golda Vom Sonnenberg, Gonzzo Earl Antonius, Graf Von Der Alten Festung, Grand King Arabona, Grand King Emanuelle, Gref Crni Lotos, Gretta Von Kaden, Gucci Von Der Koperkraft, Gunda Vom Konigsgarten, Hackel Vom Kohlerwald, Hakim Vom Brunnenweible, Harkon Vom Leinetal, Harras Vom Sofienbusch, Hassan Vom Konigsgarten, Hasso Vom Oelberg, Heike Vom Fusse Der Eifel, Heike Vom Gambrinus, Heiko Vom Hause Enzian, Hektor Vom Burgtobel, Hektor Vom Hassan Hause, Helena Vom Konigsgarten, Hella Vom Oeterkotten, Hero Od Dragicevica, Herta Mar-Ub, Hilda Von Kalacberg, Horna Mar-Ub, Hero Von Hohegeiss, Hos Od Dragicevica, Hoss Vom Gluckstern, Hoss Vom Hause Enzian, Hoss Vom Oeterkotten, Icco Von Der Donnereiche, Igor Vom Hassen Hause, Igor Vom Haus-Henseler, Igor Vom Kastanienbaum, Igor Vom Kohlwald, Imola Vom Calibra, Ingrid Vom Calibra, Irk vom Hause Hohmann, Irk Vom Obergrombacher Schloss, Itta Vom Zimmerplatz, Itus Vom Sittard, Ives Eulenspeigel, Iwan Vom Fusse Eifel, Jack Vom EmStal, Jackomo Von Der Bleichstrasse, Janka Vom Barrenstein, Janosch Von Der Scherau, Jara Von Barrenstein, Janecks Auer, Janecks Der Pahnzer, Janeck’s Gitta II, Janecks Helka, Janecks Tina, Janecks Uno, Janecks Wotan, Jennifer Von Der Teufelsbrucke, Jenny Vom Grossen Tal, Jodie Vom Grossen Tal, Jumbo Vom Kummelsee, Karl Vom Hause Neubrand, Karla Vom Haus Schmidgall, Karo Vom Schwaiger Wappen, Karol Von Der Berghalbinsel, Kevin Vom Bamberger-Tal, Kelli Vom Schwaiger Rathaus, Kimberly Von Hohegeiss, King Von Der Schwaiger Wappen, Kira Vom Schloss Rietheim, Kitty Vom Hause Sommer, Kliff Vom Schwaiger Rathaus, Lennox Von Der Koperkraft, Lindi Vom Kirkus, Lola, Maik Von Der Frankentanne, Mambo Von Der Crossener Ranch, Mambo Von Der Teufelsbrucke, Matcho Von Burgthann, Mirko Vom Calibra, Mona Vom Siedlerpfad, Morris Vom Rauchfang, Morro Vom Haus Marker, Muck Vom Gruntenblick, Nelson, Nelson Del Guado, Nelson Van Het Brabantpark, Nelson Von Der Alten Festung, Nemo Von Der Alten Festung, Nemo Vom Hegnenbacher Landl, Nero Vom Schloss Reitheim, Nicol Von Extrem, Nikol Od Dragicevica, Nobbi Vom Hegnenbacher Landl, Norris Von Der Alten Festung, Noris Vom Gruntenblick, Odin Vom Hause Neubrand, Odo Od Dragicevica, Odo Vom Fleischer, Odo Von Der Flugschneise, Oleo Vom Haus Schmidgall, Olfa Vom Hennekamp, Olgo Von Echterdingen, Oli Od Dragicevica, Onda Von Der Teufelsbrucke, Onex Vom Schwaiger Wappen, Orka Vom Hause Enzian, Orlando Vom Hause Neubrand, Oscar Van Het Brabnatpark, Osco Vom Schwaiger Wappen, Osco Von Junipera, Panther Vom Bakkes, Pasha Earl Antonius, Pasha Von Junipera, Petra Vom Fusse Der Eifel, Petra Earl Antonius, Phara Vom Haus Kertzenlicht, Pirol Vom Obergrombacher Schloss, Pixi Vom Extrem, Quantus Vom Hause Anin, Quarta Vom Hagenbach, Quenda Von Der Bleichstrasse, Quicki Aus Der Wildnis, Quini Vom Hause Neubrand, Quinn Von Der Schwarzweise, Ramzes Crni Lotos, Rasty Von Burgthann, Redwood Krest’s Fienx, Redwood Krest’s Gipsy, Redwood Krest’s Iago, Redwood Krest’s Xelly, Redwood Krest’s Youk, Renegade Vom Hause Neubrand, Rex Vom Hause Frick, Rex Von Der Bleichstrasse, Rick Von Burgthann, Rick Vom Weissen Schwan, Rios Von Der Alten Festung, Romul, Rona Van Den Brantsberg, Ronnja Von Der Berghalbinsel, Rott Berger Jaffa, Sally Pred Gozden, Santo Vom Schwaiger Wappen, Siggo Vom Mariannenthal, Simba Van Het Brabantpark, Stromer Vom Hause Anin, Thekla Vom Hennekamp, Thor, Tika, Timm Vom Mummler, Timm Vom Zimmerplatz, Torro Vom Zimmerplatz, Tough Vom Hause Neubrand, Troll Vom Hause Anin, Ursa Vom Wachberg, Uwe Vom Kursaa, Vento Od Dragicevica, Vico Von Der Flugschneise, Vulcan Von Der Teufelsbrucke, Willi Vom Hause Neubrand, Wotan Vom Filstalstrand, Wotan Vom Kastanienbaum, Xamos Vom Wolfert Turm, Xandor Of Nikola’s Lion, Xola Vom Zimmerplatz, and York Vom Salamandertal, just to name a few. Many of these lines have carried over to our breedings and have played an important part in our quest to always improve the Rottweiler breed. We ship our rottweiler puppies, rottweiler youths, rottweiler adults, and import rottweilers to new owner’s homes throughout the United States and worldwide! Rottweiler puppies and shipping provided to the following states nationally, including: rottweiler puppies for sale in Alabama, AL, and rottweilers for sale in Alabama, AL, and rottweiler shipping to Alabama, AL, and rottweiler breeder in Alabama, AL; rottweiler puppies for sale in Arizona, AZ, and rottweilers for sale in Arizona, AZ, and rottweiler shipping to Arizona, AZ, and rottweiler breeder in Arizona, AZ; rottweiler puppies for sale in Arkansas, AR, and rottweilers for sale in Arkansas, AR, and rottweiler shipping to Arkansas, AR, and rottweiler breeder in Arkansas, AR; rottweiler puppies for sale in California, CA, and rottweilers for sale in California, CA, and rottweiler shipping to California, CA, and rottweiler breeder in California, CA; rottweiler puppies for sale in Colorado, CO, and rottweilers for sale in Colorado, CO, and rottweiler shipping to Colorado, CO, and rottweiler breeder in Colorado, CO; rottweiler puppies for sale in Connecticut, CT, and rottweilers for sale in Connecticut, CT, and rottweiler shipping to Connecticut, CT, and rottweiler breeder in Connecticut, CT; rottweiler puppies for sale in Delaware, DE, and rottweilers for sale in Delaware, DE, and rottweiler shipping to Delaware, DE, and rottweiler breeder in Delaware, DE; rottweiler puppies for sale in Florida, FL, and rottweilers for sale in Florida, FL, and rottweiler shipping to Florida, FL, and rottweiler breeder in Florida, FL; rottweiler puppies for sale in Georgia, GA, and rottweilers for sale in Georgia, GA, and rottweiler shipping to Georgia, GA, and rottweiler breeder in Georgia, GA; rottweiler puppies for sale in Hawaii, HI, and rottweilers for sale in Hawaii, HI, and rottweiler shipping to Hawaii, HI, and rottweiler breeder in Hawaii, HI; rottweiler puppies for sale in Idaho, ID, and rottweilers for sale in Idaho, ID, and rottweiler shipping to Idaho, ID, and rottweiler breeder in Idaho, ID; rottweiler puppies for sale in Illinois, IL, and rottweilers for sale in Illinois, IL, and rottweiler shipping to Illinois, IL, and rottweiler breeder in Illinois, IL; rottweiler puppies for sale in Indiana, IN, and rottweilers for sale in Indiana, IN, and rottweiler shipping to Indiana, IN, and rottweiler breeder in Indiana, IN; rottweiler puppies for sale in Iowa, IA, and rottweilers for sale in Iowa, IA, and rottweiler shipping to Iowa, IA, and rottweiler breeder in Iowa, IA; rottweiler puppies for sale in Kansas, KS, and rottweilers for sale in Kansas, KS, and rottweiler shipping to Kansas, KS, and rottweiler breeder in Kansas, KS; rottweiler puppies for sale in Kentucky, KY, and rottweilers for sale in Kentucky, KY, and rottweiler shipping to Kentucky, KY, and rottweiler breeder in Kentucky, KY; rottweiler puppies for sale in Louisiana, LA, and rottweilers for sale in Louisiana, LA, and rottweiler shipping to Louisiana, LA, and rottweiler breeder in Louisiana, LA; rottweiler puppies for sale in Maine, ME, and rottweilers for sale in Maine, ME, and rottweiler shipping to Maine, ME, and rottweiler breeder in Maine, ME; rottweiler puppies for sale in Maryland, MD, and rottweilers for sale in Maryland, MD, and rottweiler shipping to Maryland, MD, and rottweiler breeder in Maryland, MD; rottweiler puppies for sale in Massachusetts, MA, and rottweilers for sale in Massachusetts, MA, and rottweiler shipping to Massachusetts, MA, and rottweiler breeder in Massachusetts, MA; rottweiler puppies for sale in Michigan, MI, and rottweilers for sale in Michigan, MI, and rottweiler shipping to Michigan, MI, and rottweiler breeder in Michigan, MI; rottweiler puppies for sale in Mississippi, MS, and rottweilers for sale in Mississippi, MS, and rottweiler shipping to Mississippi, MS, and rottweiler breeder in Mississippi, MS; rottweiler puppies for sale in Minnesota, MN, and rottweilers for sale in Minnesota, MN, and rottweiler shipping to Minnesota, MN, and rottweiler breeder in Minnesota, MN; rottweiler puppies for sale in Missouri, MO, and rottweilers for sale in Missouri, MO, and rottweiler shipping to Missouri, MO, and rottweiler breeder in Missouri, MO; rottweiler puppies for sale in Montana, MT, and rottweilers for sale in Montana, MT, and rottweiler shipping to Montana, MT, and rottweiler breeder in Montana, MT; rottweiler puppies for sale in Nebraska, NE, and rottweilers for sale in Nebraska, NE, and rottweiler shipping to Nebraska, NE, and rottweiler breeder in Nebraska, NE; rottweiler puppies for sale in Nevada, NV, and rottweilers for sale in Nevada, NV, and rottweiler shipping to Nevada, NV, and rottweiler breeder in Nevada, NV; rottweiler puppies for sale in New Hampshire, NH, and rottweilers for sale in New Hampshire, NH, and rottweiler shipping to New Hampshire, NH, and rottweiler breeder in New Hampshire, NH; rottweiler puppies for sale in New Jersey, NJ, and rottweilers for sale in New Jersey, NJ, and rottweiler shipping to New Jersey, NJ, and rottweiler breeder in New Jersey, NJ; rottweiler puppies for sale in New Mexico, NM, and rottweilers for sale in New Mexico, NM, and rottweiler shipping to New Mexico, NM, and rottweiler breeder in New Mexico, NM; rottweiler puppies for sale in New York, NY, and rottweilers for sale in New York, NY, and rottweiler shipping to New York, NY, and rottweiler breeder in New York, NY; rottweiler puppies for sale in North Carolina, NC, and rottweilers for sale in North Carolina, NC, and rottweiler shipping to North Carolina, NC, and rottweiler breeder in North Carolina, NC; rottweiler puppies for sale in North Dakota, ND, and rottweilers for sale in North Dakota, ND, and rottweiler shipping to North Dakota, ND, and rottweiler breeder in North Dakota, ND; rottweiler puppies for sale in Ohio, OH, and rottweilers for sale in Ohio, OH, and rottweiler shipping to Ohio, OH, and rottweiler breeder in Ohio, OH; rottweiler puppies for sale in Oklahoma, OK, and rottweilers for sale in Oklahoma, OK, and rottweiler shipping to Oklahoma, OK, and rottweiler breeder in Oklahoma, OK; rottweiler puppies for sale in Oregon, OR, and rottweilers for sale in Oregon, OR, and rottweiler shipping to Oregon, OR, and rottweiler breeder in Oregon, OR; rottweiler puppies for sale in Pennsylvania, PA, and rottweilers for sale in Pennsylvania, PA, and rottweiler shipping to Pennsylvania, PA, and rottweiler breeder in Pennsylvania, PA; rottweiler puppies for sale in Rhode Island, RI, and rottweilers for sale in Rhode Island, RI, and rottweiler shipping to Rhode Island, RI, and rottweiler breeder in Rhode Island, RI; rottweiler puppies for sale in South Carolina, SC, and rottweilers for sale in South Carolina, SC, and rottweiler shipping to South Carolina, SC, and rottweiler breeder in South Carolina, SC; rottweiler puppies for sale in South Dakota, SD, and rottweilers for sale in South Dakota, SD, and rottweiler shipping to South Dakota, SD, and rottweiler breeder in South Dakota, SD; rottweiler puppies for sale in Tennessee, TN, and rottweilers for sale in Tennessee, TN, and rottweiler shipping to Tennessee, TN, and rottweiler breeder in Tennessee, TN; rottweiler puppies for sale in Texas, TX, and rottweilers for sale in Texas, TX, and rottweiler shipping to Texas, TX, and rottweiler breeder in Texas, TX; rottweiler puppies for sale in Utah, UT, and rottweilers for sale in Utah, UT, and rottweiler shipping to Utah, UT, and rottweiler breeder in Utah, UT; rottweiler puppies for sale in Vermont, VT, and rottweilers for sale in Vermont, VT, and rottweiler shipping to Vermont, VT, and rottweiler breeder in Vermont, VT; rottweiler puppies for sale in Virginia, VA, and rottweilers for sale in Virginia, VA, and rottweiler shipping to Virginia, VA, and rottweiler breeder in Virginia, VA; rottweiler puppies for sale in Washington, WA, and rottweilers for sale in Washington, WA, and rottweiler shipping to Washington, WA, and rottweiler breeder in Washington, WA; rottweiler puppies for sale in West Virginia, WV, and rottweilers for sale in West Virginia, WV, and rottweiler shipping to West Virginia, WV, and rottweiler breeder in West Virginia, WV; rottweiler puppies for sale in Wisconsin, WI, and rottweilers for sale in Wisconsin, WI, and rottweiler shipping to Wisconsin, WI, and rottweiler breeder in Wisconsin, WI; rottweiler puppies for sale in Wyoming, WY, and rottweilers for sale in Wyoming, WY, and rottweiler shipping to Wyoming, WY, and rottweiler breeder in Wyoming, WY.